Heir to ancient cultures and a rich colonial tradition, Peru is a magical country which boasts one of the richest biodiversities of Earth. Ten thousand years of history are alive in many amazing destinations. While Peru typically evokes images of Machu Picchu and the Inca empire, the country has hundreds of sites, legacy of even more ancient civilizations which bequeathed their art, customs, rituals, their wisdom and skills. 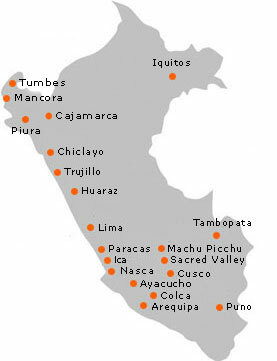 - LIMA, city of the Viceroys and of world class gastronomy. - THE MYSTERIOUS NASCA LINES and PARACAS National Reserve. - HUARAZ and the Huascaran National Park. - CHAVIN and the Huayhuash mountain range. - CUSCO and the Sacred Valley of the Incas. - THE INCA TRAIL, the highway of the great empire. - MACHU PICCHU, the lost city of the Incas. - MANU NATIONAL PARK, the huge biological reserve. - LAKE TITICACA, the world's highest navigable lake. - AREQUIPA, the white city and the majestic Misti volcano. - COLCA and COTAHUASI, the deepest canyons in the world. - The SOURCE OF THE AMAZON, Iquitos, Nauta, Pacaya-Samiria. - KUELAP, an ancient city in the clouds. - CAJAMARCA, the spa of the Incas. - TUCUME, the valley of the pyramids. - THE LORD OF SIPAN, the golden tomb. - TRUJILLO, capital of the eternal spring. - CHAN CHAN, the ancient adobe metropolis. - AYACUCHO, the city of churches and site of the last battle for independence. - THE NORTHERN BEACHES, a warm blue paradise.